Revision week is well underway and the library is getting busier and busier. Libraries are great places to study, offering a quiet, calm space to work. 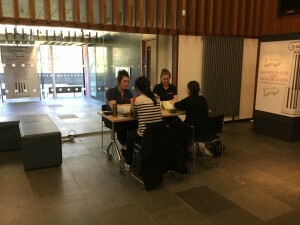 The Main Library is even offering extra study spaces for students during this time. However, we have more to offer than study spaces! As part of our ongoing campaign to help students, we have been offering free hand massages today! We hope that everyone who received a massage really benefited from it, but if you missed out, never fear! We have set up a Relaxation Table in the Main Foyer, which will be around for the next few weeks, offering fun activities such as origami, puzzles, and colouring. Remember, it is important to take breaks to stay focussed! There will also be aromatherapy, bubble wrap, and relaxing herbal tea for students to take away, among other things. 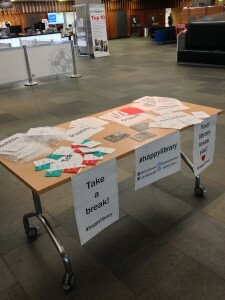 Don’t miss out, and make sure to Tweet or Facebook us your thoughts and creations (#happylibrary)! Also, watch out for us on Friday, when we will be celebrating Shakespeare’s 400th birthday and World Book Night! Follow us on Facebook and Twitter for more details. 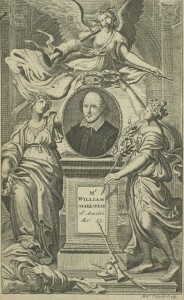 Title page of The Works of Mr William Shakespeare, Vol.1, 1709. S*.30.1. © The University of Edinburgh. See it here. Remember, we have more than just textbooks and study spaces! Happy studying! This entry was posted in Collections, Interns, Library and tagged happylibrary on April 20, 2016 by universitycollectionsvolunteers.